"Learn from the Pros How to Build Effective Backlinks in Order to Successfully Generate a High Volume of Quality Visitors to Your Website"
Placing backlinks correctly is an important part of SEO marketing that requires strategic knowledge to ensure that it benefits your website rather than making things worse. Linking to the wrong websites can have the opposite effect, reducing your website ranking with search engines and decreasing your website traffic. 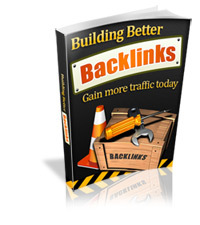 Let Us Show You How with our Book "Building Better Backlinks"